It is the "journey of a man and nation together"
After Bharat from the circus, Salman Khan introduces fans to a new chapter of his upcoming film's protagonist. Unlike the previous two posters of Bharat, this one focusses not on Salman Khan, instead on Katrina Kaif, whom he calls 'Madam sir.' 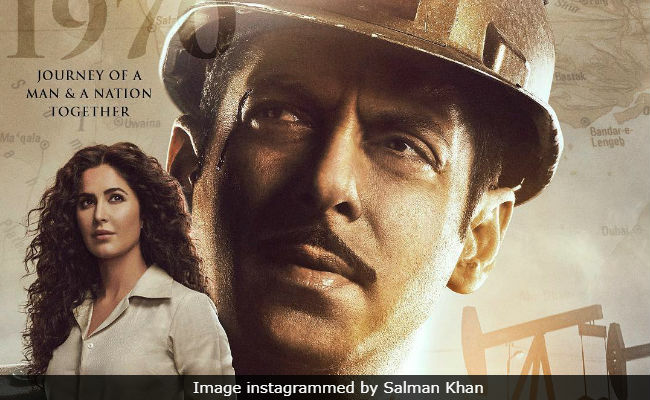 Going by the backdrop of mining, it appears that Katrina Kaif plays the role of the site in-charge where Salman Khan's Bharat works as a miner. "Aur phir humare zindagi mein aayi 'Madam Sir'," he captioned the post, which depicts the characters from the year 1970 - six years after Bharat was in the circus as a daredevil stuntman. The makers of Bharat describe the film as the "journey of a man and nation together." The plot follows the protagonist's journey through different phases of his life, all supported by different looks. In the first poster shared by Salman Khan, his character appeared to be in his 60s sporting salt-and-pepper look. "Jitne safed baal mere sar aur dhaadi mein hain, usse kahin zyada rangeen meri zindagi rahi hain! ," Salman Khan captioned the post. The following day, Salman Khan revealed his circus stuntman look, dressed in a jazzy white jacket, Salman's swagger is off the charts (even Paris Hilton thinks so). "Jawaani humari Jaaneman thi!," he wrote. Bharat also stars Disha Patani, Tabu, Sunil Grover and Nora Fatehi. The film is directed by Ali Abbas Zafar and produced by Atul Agnihotri.